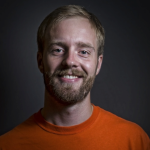 Today’s post is from William Woods, a doctoral candidate in Electrical Engineering at Stanford University. 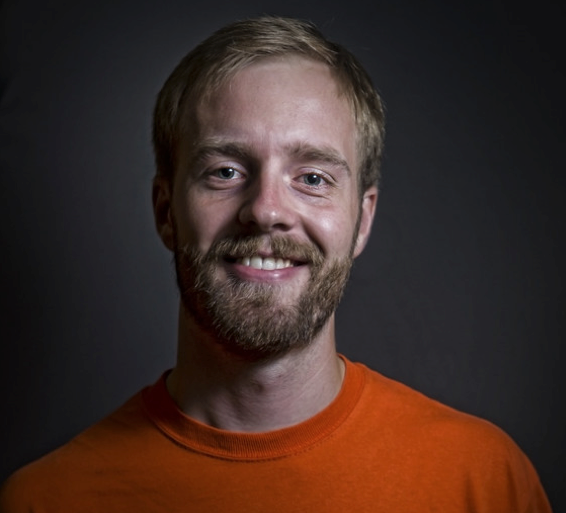 He investigates radioscience and remote sensing, with a focus on signal processing for the radioscience experiment (REX) onboard New Horizons. He studies both engineering and science under Dr. Ivan Linscott and Dr. Howard Zebker at Stanford. I study remote sensing and signal processing for the radioscience experiment (REX) onboard New Horizons. REX performs three experiments at the Pluto system. The first is radio occultation, in which NASA’s Deep Space Network (DSN) and REX form a radar system that probes the atmosphere of the occulting body. REX performs radio occultation on both Pluto and Charon that yields estimates of atmospheric temperature and pressure as a function of altitude. REX also performs thermal scans of Pluto and Charon. Thermal scans passively measure blackbody radiation emitted by the target in order to estimate surface temperature. Finally, REX data estimates mass of the entire Pluto system by measuring curvature in New Horizons trajectory due to local gravity conditions. The spreading of energy as it travels through the atmosphere to REX severely limits spatial resolution of raw radio occultation data. Without extensive post-processing this resolution can be thousands of times worse than the experiment’s design specifications. I develop linear and non-linear techniques that focus energy in REX occultation data down to a resolution near the fundamental limit of the instrument itself. 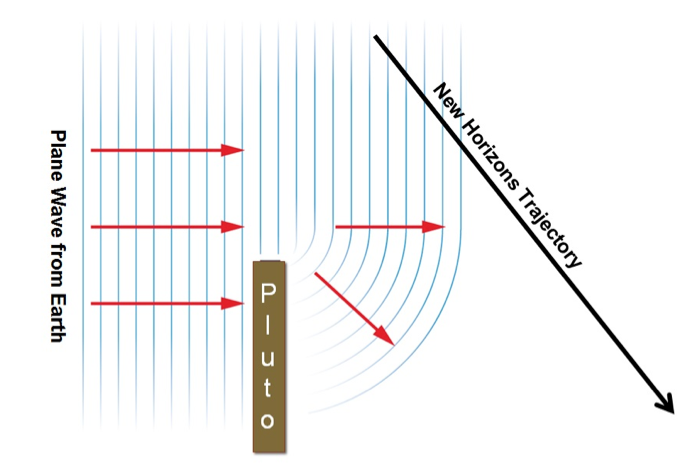 Figure 1 above shows the geometry of New Horizons’ radio occultation of Pluto. Historic occultation techniques exchange the locations of transmitter and receiver, but experiment fundamentals remain the same. Earth DSN transmits a monochromatic plane-wave of 7.2 GHz to New Horizons as it flies behind Pluto. 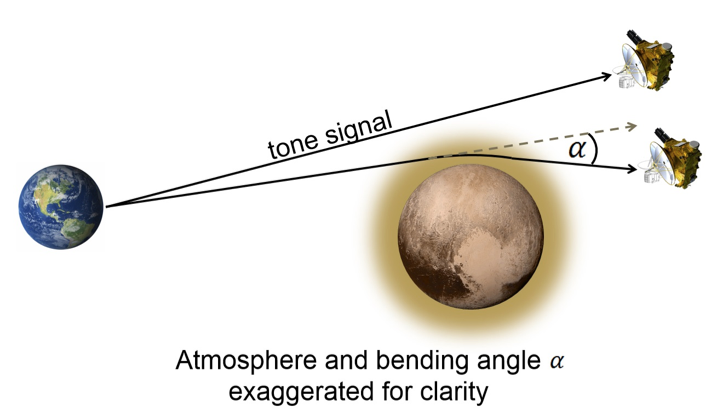 The signal passes through Pluto’s atmosphere and refracts, resulting in a small change of direction, exaggerated for clarity in Figure 1. The direction change manifests as a Doppler shift in frequency, therefore REX measures a signal rate slightly different from the original 7.2 GHz. The direction change, or bending angle, is proportional to dielectric constant in the atmosphere. Given prior knowledge of Pluto’s atmospheric composition, we use dielectric constant to calculate temperature and pressure in the atmosphere as a function of altitude. Energy in the plane wave also spreads as it passes Pluto’s limb, shown above in Figure 2. This energy spreading, called diffraction, causes each single data point measured at REX to be a weighted sum of energy from many points in Pluto’s atmosphere. Without focusing the energy back into its original point locations in the atmosphere we can only achieve spatial resolution on the order of a few kilometers. But once focused during post-processing the REX radio occultation at Pluto measures atmospheric temperature and pressure at absolute accuracies of 3 K and 0.1 Pa, respectively, with spatial resolution of a few meters. Preliminary results from REX data processing show surface pressure on Pluto of approximately 10 uBars. 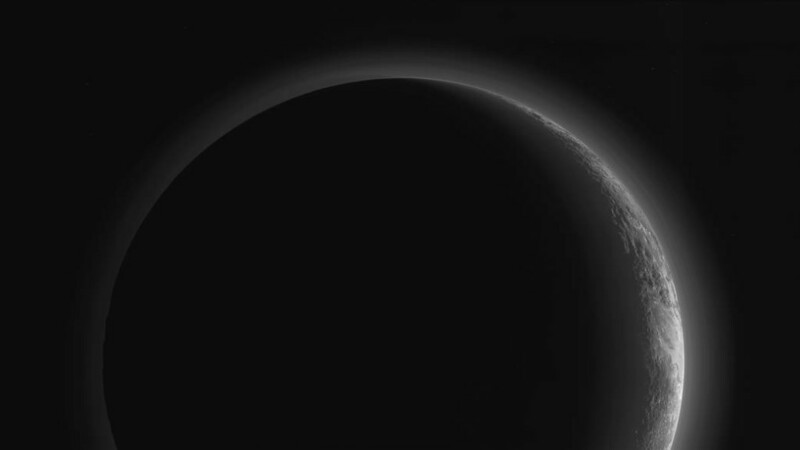 My final contribution to New Horizons is a short video that explains the significance of the mission to the broader public. I attempt to put the science and engineering of New Horizons into the human context of Dr. Ivan Linscott, my PhD advisor at Stanford University. Enjoy.